There is a high chance that people will copy your photos or images that you post on the Internet. Some do that with attribution, others without. Sometimes you may want to know where your images have been posted on. A simple example is your profile photo on Facebook or your Google Profile. Maybe you want to know if another site copied that photo and used it without your permission. If that is the case, you may want to contact the site owner to stop this from happening. So called reverse image search engines can be used to find copies of your images on the Internet. The most prominent ones are Tineye, Yandex and the recently updated Google Image Search engine. While you could use those image search engines manually every time you want to find copies of a picture on the Internet, it is often faster and more comfortable to use a browser extension to do so. The Who stole my pictures add-on for Firefox offers those capabilities. The extension adds a new entry to the browser's right-click context menu when the mouse cursor hovers over images. You then have options to select one of the five support reverse image search engines separately (Baidu and Cydral are the remaining two), or perform a search on all five search engines directly. If you select the latter option five browser tabs will open with the results of the five image search engines. The options of the extension allow you to remove search engines from showing up in the context menu. This has also an effect on the multi-search option as removed image search engines are not included in that search anymore. 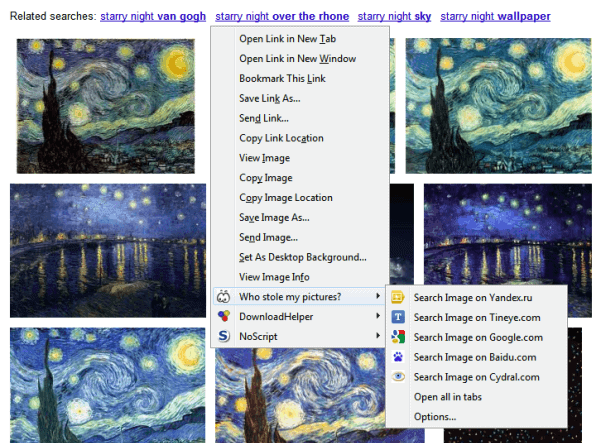 Who Stole My Pictures is a handy Firefox add-on for users who want to search for copies of images on the Internet. Firefox users can install the extension directly from the official Mozilla Firefox add-on repository. i want to know can i identify that anyone has copied my post or not?? I tried the plugin and it’s okay, but some of the reverse image site engines no longer work on the plugin… and I think Google Reverse Image search is by far the best, because you can also further narrow the search by specific site / content.